Wide Boys – Buckjumper Mk.IV: The S56 class. By the beginning of the Edwardian period the Great Eastern Railway was handling the largest number of individual passenger journeys in the world, yet the demand for increased suburban services continued unabated, and before long the close-coupled 15-carriage 4-wheeled suburban sets were bolstered by the addition of an extra carriage, catering for 108 extra seated and standing passengers. During the morning peak, in the space of one hour, twenty four trains pulled into Liverpool Street’s West Side suburban platforms 1 – 4 made up of eight from Enfield, two from Chingford, ten from Walthamstow (on the Chingford Line) and two from Edmonton Lower Level by way of Angel Road (fast services via Clapton, and slow services via Lea Bridge and Stratford). This is what it’s all about! Buckjumpers at Bethnal Green from the Liverpool Street end of the station, Basilica Fields is situated about a mile down the line away from the camera. Stage left an R24R in the Up platform of the 1872 Suburban lines and stage right an S56 standing in the Up platform of the Local lines (ex-Main line of 1840). Curving round the back on the far right are the Through lines of 1891 and carriage sidings. The tall Type 8 West Junction signal box controls the forest of typical GE sky-arm LQ boards which are comprehensively stayed. The second box on the Up Local platform is in fact the Timekeeper’s box. The two trains are probably carrying about 2400 passenger between them, all from the Chingford line. Photograph © Public Domain. The 16-carriage trains were designed to carry 848 seated passengers (20,352 per hour), plus an extra six standing in each compartment bringing the total weight of the train to around 280 tons gross. The little Holden 0-6-0 tanks, weighing just 40 tons, not only had to negotiate the 1 in 70 Bethnal Green bank outside the terminus but the tightly-timed and steeply-graded lines on the north flank of the Thames Valley. One contemporary writer recorded peak trains disgorging 1200 seated and standing passengers, and by the end of the Edwardian period the company was carrying over 200,000 suburban passengers a day – 73 million a year, a figure which eventually rose to over 107.5 million during ‘The Jazz’ in the 1920s. 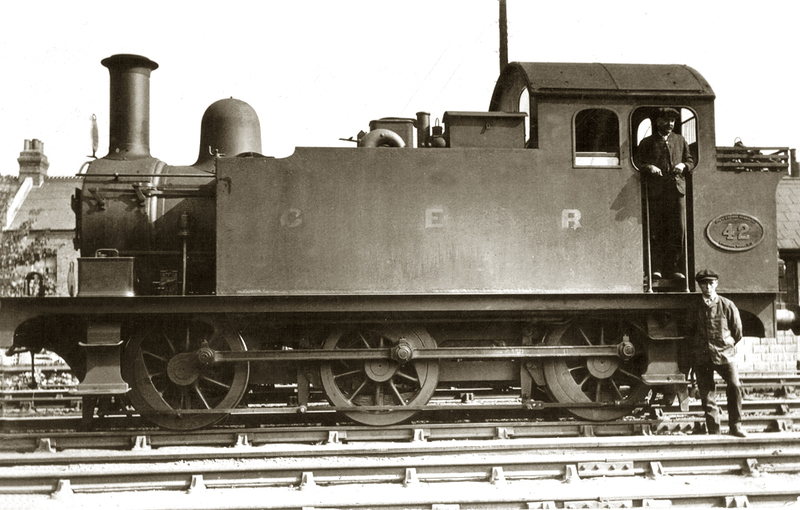 When the rebuilding of the R24 class was at its peak in 1904, additional new passenger Bucks were required by the Running Department, so Holden took the R24R design and increased the coal capacity by 5cwt to 2 tons 10 cwt by widening the bunker and cab to match the 5 inch wide tank extensions. Mindful of the 180 lbs per square inch boiler extending a considerable distance into the cab he also altered the doorway to a symmetrical keyhole shape. The locos were built in two batches to Orders S56 and P57, the former giving the engines their classification. The first batch were given the running numbers 51-60 and were handed over to the Running Department between 30 May and 30 June 1904, and the second batch numbered 81-90, entering service between 2 September and 28 October of that year. By the time the S56s were introduced most of the peripheral improvements had been made to the Bucks and in the couple of years to the end of the Basilica Fields timeframe there were no alterations of note to the class. The new engines featured prominently on the peak suburban services, but as before, during the slack hours they were utilised in the goods and shunting links as well as on empty carriage stock movements out of Liverpool Street. At one time there was a Connoisseur Models kit of the LNER J69, but the closely related J68 (GER C72) kit introduced several years later is a huge improvement in terms of fidelity and detail. I’ll be building two S56 class locos by converting the J68 kit by means of milled tank, cab and bunker parts from Colin Dowling’s range. The only Buckjumper to survive is no.87 from the P57 series of the S56 class. It has been kept in GER lined blue livery since withdrawal in 1962 and is currently on display at Bressingham Steam Museum in Norfolk. Here it is during its stay at the NRM. 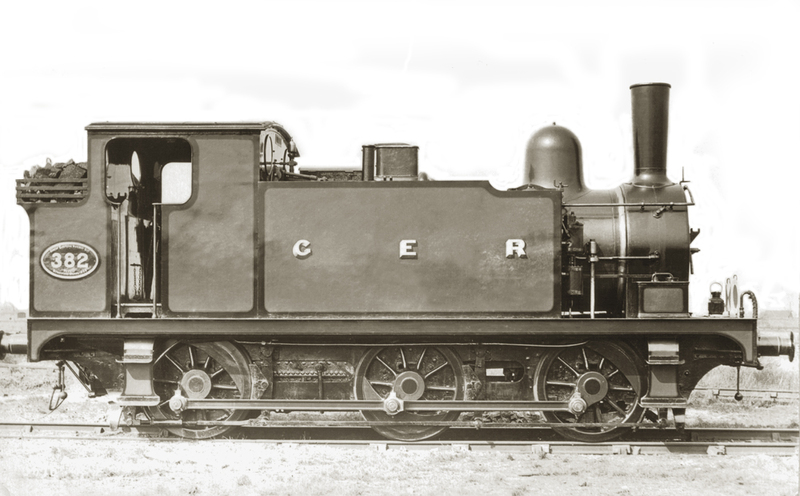 The twenty locos of the S56 class didn’t mark the end of the Buckjumper development and in 1912, under James Holden’s son Stephen Dewar who had, somewhat controversially, taken the position of Locomotive Superintendent in 1907, ten more shunting locos were required for increased traffic. 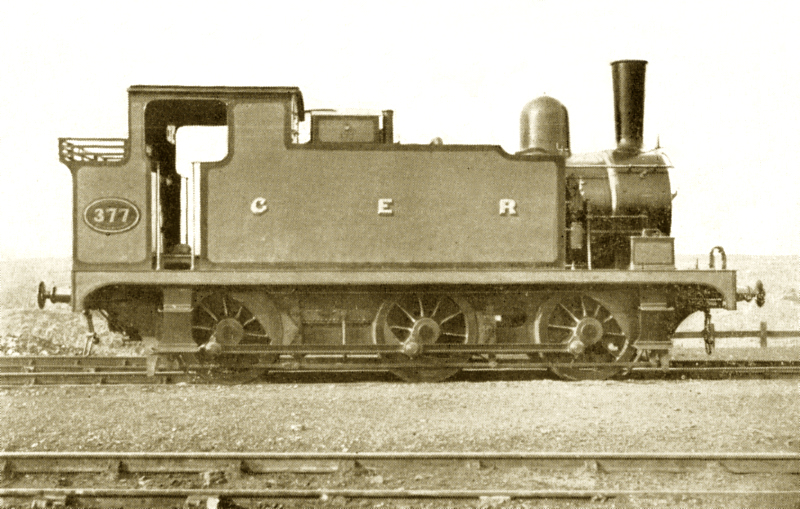 It made economic sense to build ten new passenger locos and demote the original R24 batch of passenger locos to shunting duties, stripping them of their 10-spoke balanced wheels, Westinghouse brakes, screw reverser, screw couplings and condensing apparatus (though they retained the condensing chambers and vent pipes), and their boilers were replaced or reduced to 160psi. Too late for Basilica Fields; a passenger Buck of the C72 variety built in 1912 with all the mod-cons, and even Goliath would have trouble banging his head on the raised arc roof. Still couldn’t keep the old girls clean though… 10-spoke wheels, Westinghouse brakes, condensing gear (albeit new full-width chambers) and screw reverser are second-hand courtesy of the R24 batch of 1890! Photograph © Public Domain. 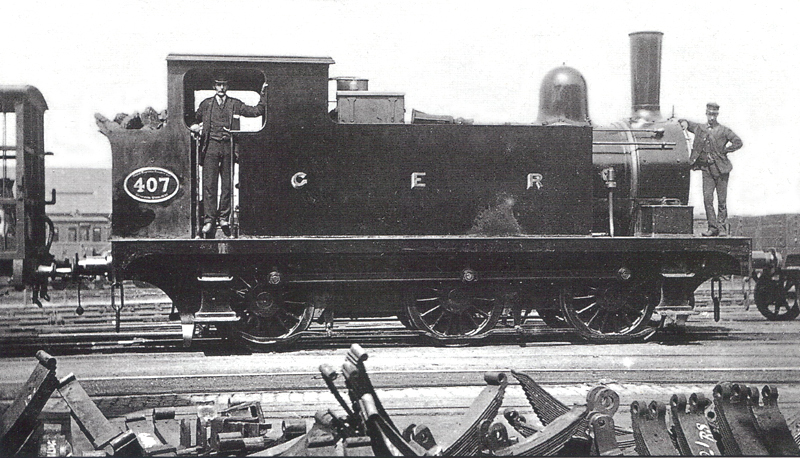 The new locos, classed C72 were virtually identical to the S56 engines, albeit with cosmetic modifications to bring them in line with the then new GER image, so incorporated built-up rimmed chimneys, arched windows in not only the front and rear weatherboards but also the cab side-sheets, and a high single-arc roof. The following year under new Locomotive Superintendent Alfred Hill, ten more engines to the shunting specification were built, and just before Grouping one further batch of the shunting series was ordered which were released to traffic at the end of the first year of the LNER, bringing to an end 37 years of development and a total of 260 Buckjumper tanks. Standing outside the small engine shed at Spitalfields, the final development of the Buckjumper shunters, class C72 to Order G75, no.24 was released to traffic on 9th January 1914. It has all the latest mod-cons of the passenger design mixed with the typical flat-topped tanks, three-link couplings, 15-spoke unbalanced wheels and outside brake pull rods (by now anachronistic on new builds) with dropped sections in the path of the 11″ throw crank pins. The loco is finished in the goods and shunting plain black livery and sports the grime and stains of working hard in the East End. 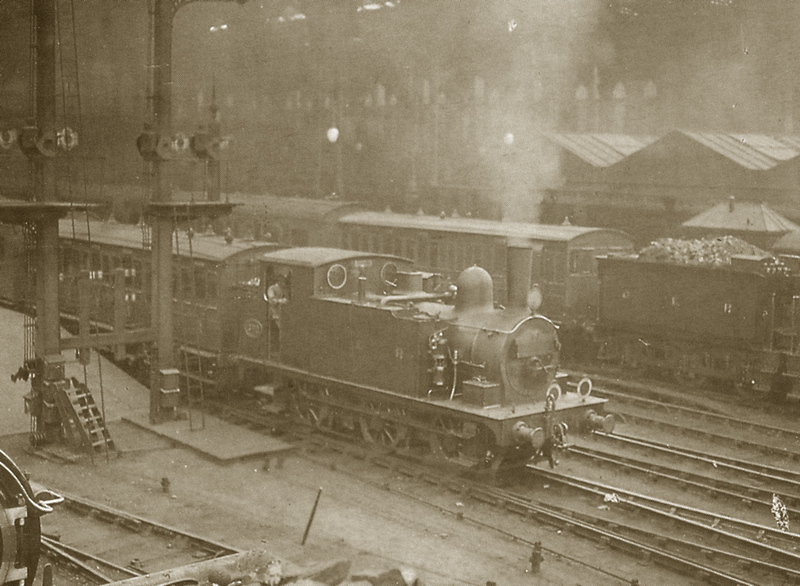 The final batch built under the LNER in 1923 were the penultimate locos to be built at Stratford Works. Photo ©Public Domain. Document SX11702 – NRM, York. Composition of wide suburban sets. Locomotives Illustrated 116 – The Great Eastern Railway ‘Jazz’ engines. In Search of Buckjumpers – Iain Rice, Model Railway Journal issues 35 & 36. GER Appendices to the Working Timetables of 1891 and 1906. Development – The Buckjumper Mk.III, Part 2: The R24R ‘Rebuilt’ class. 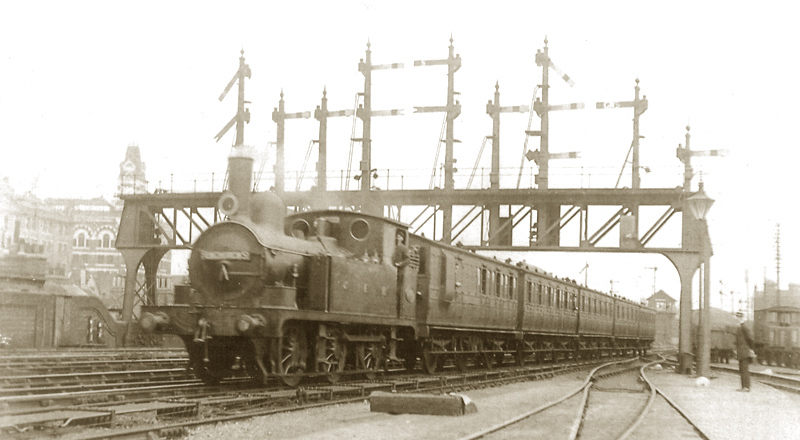 In the previous entry we left the London Suburban traffic growing at an exponential rate prompting the building of the final two batches of R24s with new boilers pressed to 160lbs per square inch, and the handing over to the running Department of the last of the class, no.169 on 6th December 1901. However, even by the time no.169 had entered service, both the Chingford and Enfield lines had reached saturation point, and severe overcrowding was rife on the fifteen-carriage close-coupled 4-wheel sets during peak hours. R24R no.372, rebuilt in late 1904 but not released back to traffic until early 1905, prepares to leave platform 10 at Liverpool Street with an ECS working to Temple Mills. 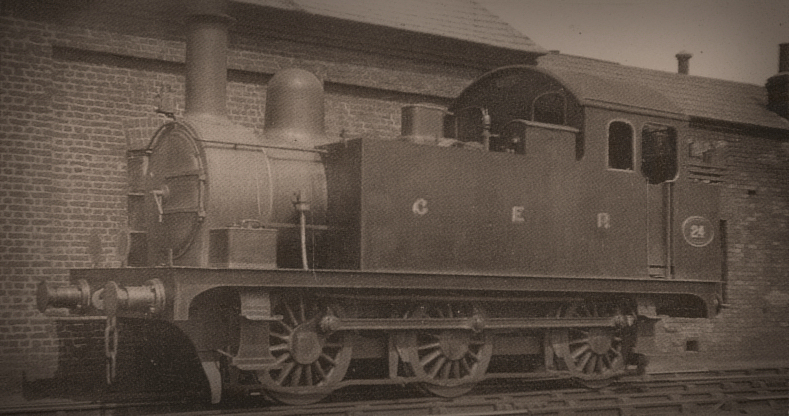 No.372 was from the N33 batch of 1894 with high side sheets covering the integral condensing chambers on the tank tops. The new widened chambers extending to the tank sides can be seen here. Four-column safety valves in the forward position on the back ring of the boiler. Not looking particularly clean is it? Also note the express in the background still has a 6-wheeled brake van; the GER was very slow to introduce bogie brakes, even to top link services. Photograph © Public Domain. The design was a success, and between 1898 and 1903 a total of 531 carriages entered service. Although none were built in 1904, a further 70 were built in 1905 bringing the total to 601 examples. Poor quality postcard (I’m on the lookout for a replacement) but very appropriate subject matter. Number 386 was the last of the F36 series built in 1895, and the first of the class to receive the extra wide 5″ tank extensions in early 1904 (see text below). 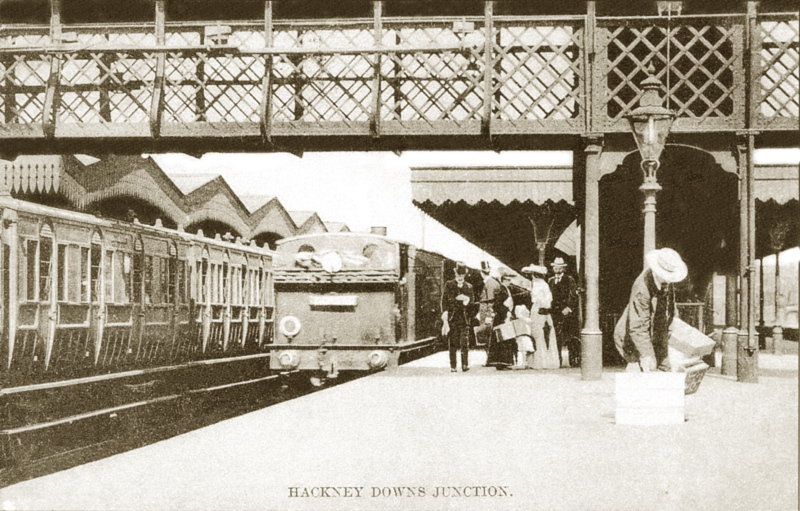 The photograph was taken within a year of rebuilding and is seen at Hackney Downs on an Up train from Enfield Town to Liverpool Street. A new wide suburban carriage set of 1898 is in the down platform and the recessed doors are clearly visible. 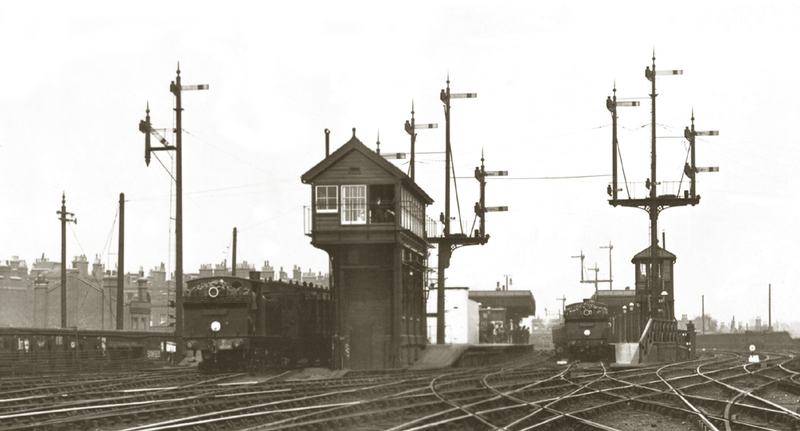 The round tops to the doors reflect the practice on not only the Metropolitan Railway, but the Great Western, where Holden was Chief Assistant to William Dean and at the forefront of converting broad gauge carriage stock to standard gauge. And yes, some of the passengers have been inked in with Ye Olde Photoshoppe! Photograph © Public Domain. Concurrently an unique suburban train was designed and built for the Enfield line comprising of six 12-wheeled 54ft bogie carriages bookended with a pair of eight-wheeled 46ft bogie brake thirds. Although the comparatively luxurious ride was a tremendous success with passengers, it was far heavier than a 15-carriage set of four-wheelers, and although (to the delight of the travelling public) it remained employed on the Enfield line for the next 48 years, the experiment was not repeated. Holden instead turned his attention to the existing 8ft wide suburban stock built between 1882 and 1898, and rather ingeniously split the carriages down the middle and spliced in a 12″ wide insert. These widened carriages had the same capacity as the new six-a-side sets, but to the delight of the Directors of the Board, the exercise required only a very modest expenditure of £30 per carriage, effectively postponing the introduction of new suburban stock beyond the demand met by the new six-a-side carriages for many years to come. Cigars and champagne all round! In consequence a total of 710 suburban four-wheel carriages were widened between 1902 and 1904. 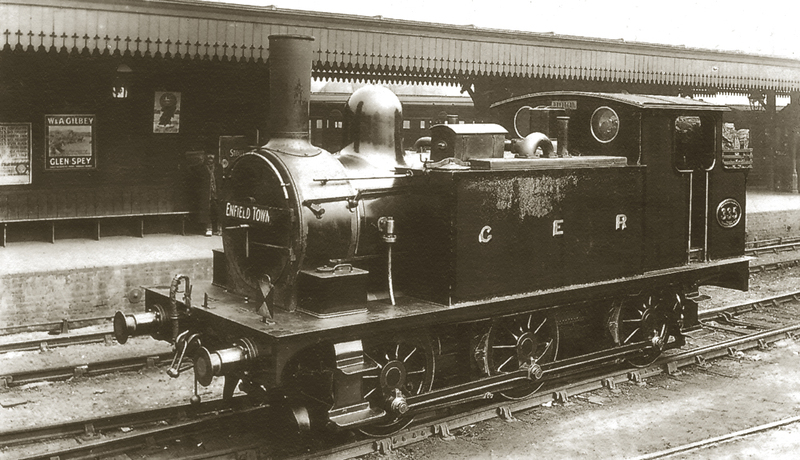 No.358 of the R29 series built in 1892 was given 5″ tanks during its second rebuild towards the end of 1904. The separate narrow condensing chambers are prominent on the tank tops and there’s a considerable blistering of paint on the tank side from scalding water and steam. The location is Palace Gates and the destination is Liverpool Street. Ghostly faces peering through the spectacles show there’s not quite the regulation number of crew on the footplate…Photograph © Public Domain. The new, heavier trains tested the R24 Buckjumpers to their limit on the steeply-graded, tightly timed suburban services. 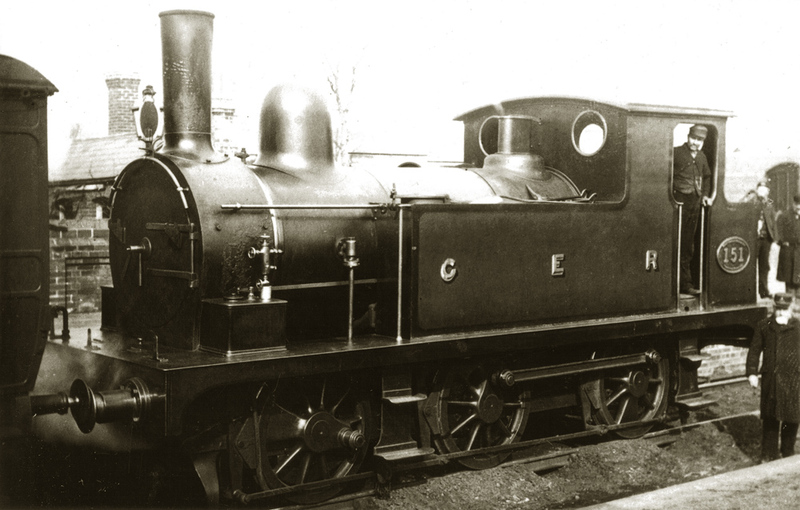 Although they shared the boiler type with the T18s, it was by fortune rather than design that the 6″ longer trailing wheelbase of the R24s could be exploited to fit a new boiler with a longer firebox and pressed to 180lbs per square inch. In July 1902, no. 332 of the original R24 batch was passing through the Works and chosen as test subject for the new boiler. 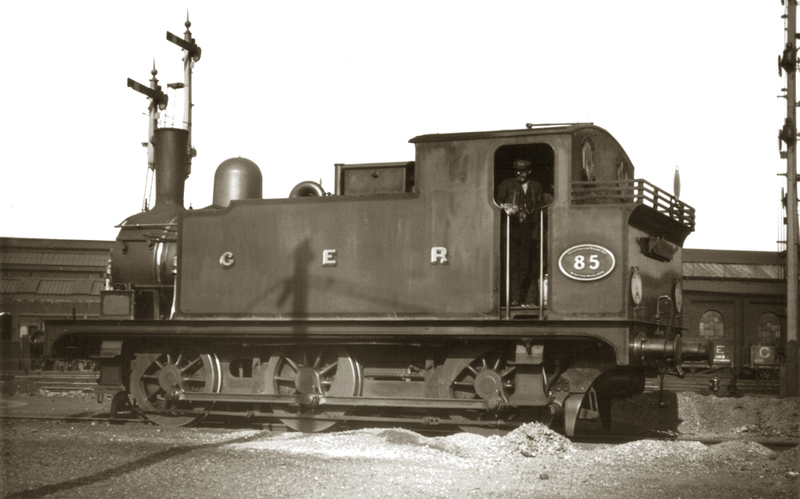 The longer firebox extended into the cab by an extra 8 inches, giving a corresponding increase in the grate area by 2 square feet and increasing the tractive effort of the locos from 16,970lbs to 19,019lbs. Four column Ramsbottom safety valves within a rectangular casing were fitted instead of the usual two-column valves in the usual position over the firebox. The success of no.332, classed in the Great Eastern Loco Register as R24 Rblt or R24R was soon evident and in September three more locos, numbers 329, 341 and 342 passed through the Works and were similarly dealt with. Following trials it was decided that an increase in the water capacity was desirable. In February 1903 no.334 was fitted with the new boiler and at the same time the side tanks widened by four inches, increasing the water capacity from 1000 to 1140 gallons. Down to January 1904 a further ten locos (some sources erroneously suggest nine) had their tanks widened thus, and all except no.379 were from the earliest batches, originally built without condensing apparatus. 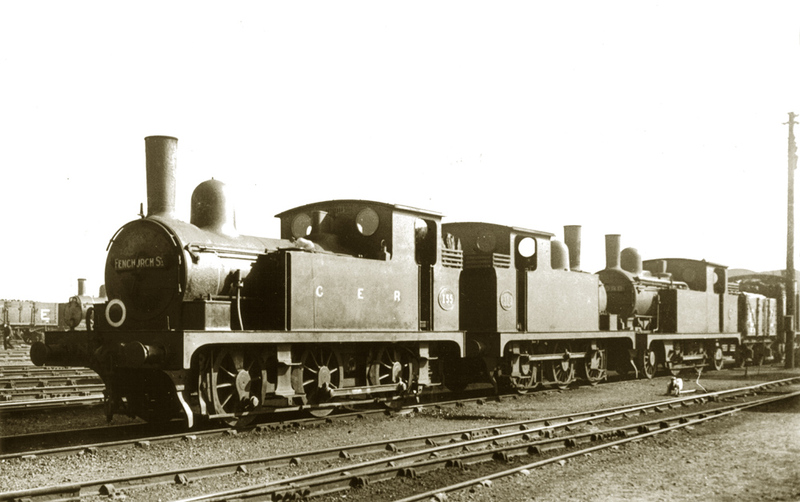 When rebuilt these locos retained the square-topped shape to their side tanks and the original narrow condensing chambers on top. No.379 of Order F36 had side sheets which extended upwards with an integral condensing chamber, and when rebuilt the chambers were also widened to the full width of the tanks. From the original R24 series of 1890, no. 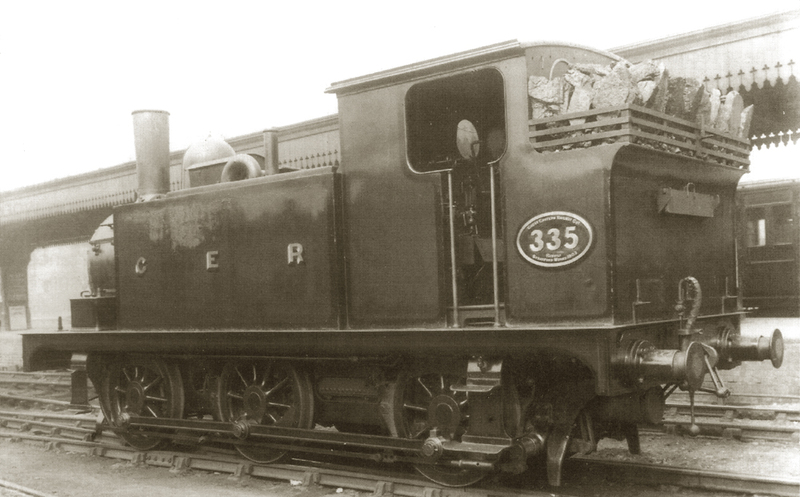 335 was one of the 1903 rebuilds with 4″ tank extensions and the new four-column Ramsbottom safety valves still on the firebox. The condensing chambers are the ones it was fitted with in 1893 and are in the same position, so now lie inboard of the tank edge. 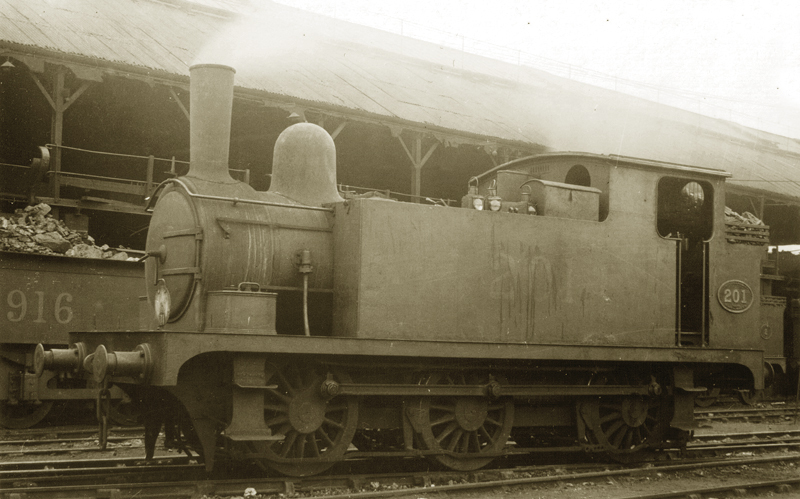 The Macallen blastpipe and condensing cranks and operating rods are clearly seen on the smokebox, and the loco retains the separate handrails. 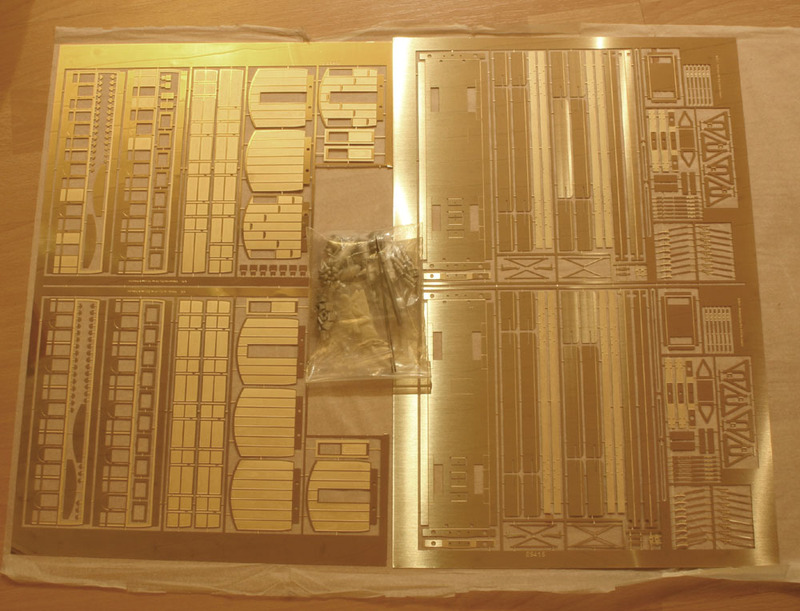 The square diamonded board on the nearest lamp iron indicates the loco is not to be moved. Steam entering the tanks via the condensing pipes has distressed the paintwork and caused it to blister. With so many engines fitted with the apparatus it’s surprising that the GER didn’t fit a protective side sheet to the tanks as the Midland did to its own condensing locomotives. Photograph © Public Domain. At least the first half-dozen or so rebuilds, and possibly all of those rebuilt in 1903 had their four-column safety valves fitted in the usual position over the firebox, but thereafter it was decided the firebox crown needed to be comprehensively stayed, and the valves were moved forward onto the back ring of the boiler. Later, as the R24Rs with valves over the firebox were rebuilt for a second time, the valves were moved to the forward position. When the four-column valves were moved forward, a small kink was set into the condenser pipe linking the two chambers to clear the valve seat. We’re rather fortunate to have two shots of No.335 taken on the same day at Enfield, and this rear three-quarter aspect clearly shows the effect of the 4″ tank extensions and how the livery was altered to take them into account. The bunker is rather neatly stacked to capacity and I’ll wager a jar of jellied eels that in practice there simply wasn’t time between trains for such precision, coal being poured in from wicker baskets pre-filled on the timber coaling stages at either end of the line. How frequently did they have to replace the spectacle glass? 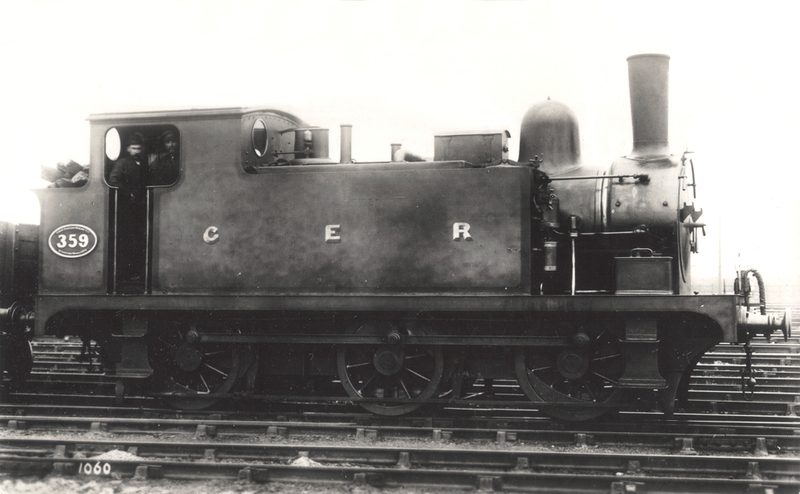 Great Eastern practice was to cast new brass number plates each time a locomotive was rebuilt (i.e. fitted with a new boiler), and the plate on No.335 clearly states that it was rebuilt at Stratford Works in 1903. Photograph © Public Domain. From February 1904 and starting with no.386, all R24s entering Works for rebuilding had their water capacity increased to 1180 gallons by receiving five inch tank extensions. None of those fitted with four inch tank extensions in 1903 ever received the larger 1180 gallon tanks, but the first four rebuilds from 1902 which still had their original 1000 gallon tanks were eventually given the five inch extensions. The year 1904 turned out to be the most prolific year for rebuilding the R24 class with twenty four examples passing through Works. By the end of the period covered by Basilica Fields one half of the passenger R24s had been rebuilt, and by 1921 a final total of 95 out of 100 locos had been converted. No 382 was in the Works at the same time as no.372 (top), between late 1904 and early 1905, but in this case the number plate records 1905 as the rebuild date. The profile makes a nice comparison with no.377 in the previous entry. Suddenly the Bucks look like they mean business! Photograph © Public Domain. The rebuilding process didn’t alter the fact that a high proportion of the locos were only required during peak hours, and so the process of minor maintenance and goods trip/shunting duties during the slack hours and overnight continued as before. 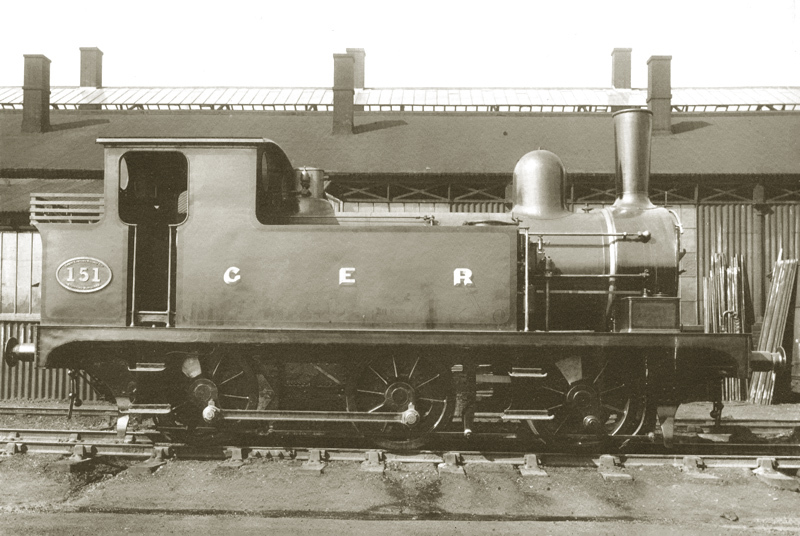 Although it might seem natural to follow the example of the Great Eastern and convert the Connoisseur J67 kits to R24Rs, in fact that involves a considerable amount of work as not only will new parts be needed for the boiler, tank sides, fronts and tops of the tanks, wider condensing chambers (on the later builds) but a new, wider running plate/footplate too. 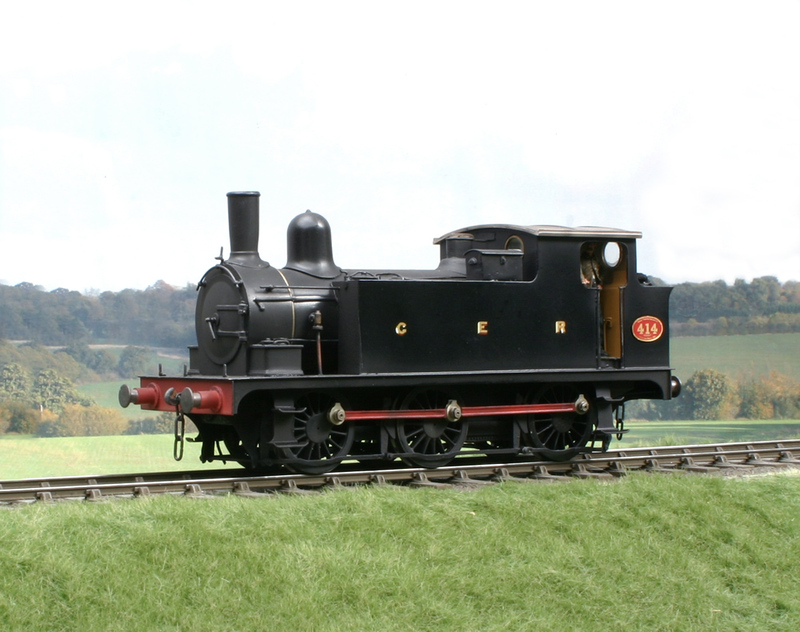 Far easier then to utilise the excellent Connoisseur J68 kit (Great Eastern class C72 which appeared too late for Basilica Fields) which has the correct boiler, running plate and condensing chamber, and simply use new milled tanks from Colin Dowling’s range of parts. I have sufficient kits and bits here to produce two examples, one with square-topped tanks and four-inch wide extensions and the four column safety valves over the firebox, and one with the higher tank side sheets, integral condensing chambers, five-inch wide tank extensions and the safety valves in the forward position over the rear ring of the boiler. Model Railway Constructor Annual 1984 – article by John Lewis on Dean’s GWR stock. Metropolitan Jubilee 4-wheel coaching stock, part 3. The only surviving Metropolitan Jubilee Carriage, number 353, which is currently stored at Acton in ‘as found’ condition, is to be restored to full working order in 2013 to mark the 150th anniversary of the London Underground. This is excellent news, but look out for reports about it being built for Circle services when in fact it was one of a batch of 32 carriages built for the Extension services to Chesham and Aylesbury, and therefore exhibited a number of detail differences from those carriages built for running on the Inner Circle. Therefore anticipate the usual media hyperbole when it is once again released to traffic! Great Northern Railway 4-wheeled coaches. Part 1. Last April (was it really a year ago?) I remarked that there was a dearth of information for GNR close-coupled 4-wheel suburban coaching stock suitable for Basilica Fields. Despite my recent lack of updates to the blog due to ongoing events, progress on Basilica Fields continues to be made – albeit (mostly) not by me! Late last year I made a couple of contacts through the GNR Society, and my subsequent bombardment of questions led to an interesting flurry of emails, and, although the situation is still not totally clear at present, it looks as though a big step has been made towards eventually facilitating the building of necessary stock required for those services, and the acquisition of some drawings. Graham Beare has also been hard at work scouring accident reports instigated by the Board of Trade, and sending me relevant information, the best of which, so far, divulges the classification and running numbers of a twelve carriage close-coupled set running between Potters Bar and Kings Cross in 1898. Brake 3rd no.248, 3rd no.1636, 2nd no.1512, 2nd no.1511, 2nd no.1508, 1st no.1534, 1st no.1443, 2nd no.319, 2nd no.1323, 3rd no.1499, 3rd no.1505, Brake 3rd no.399. 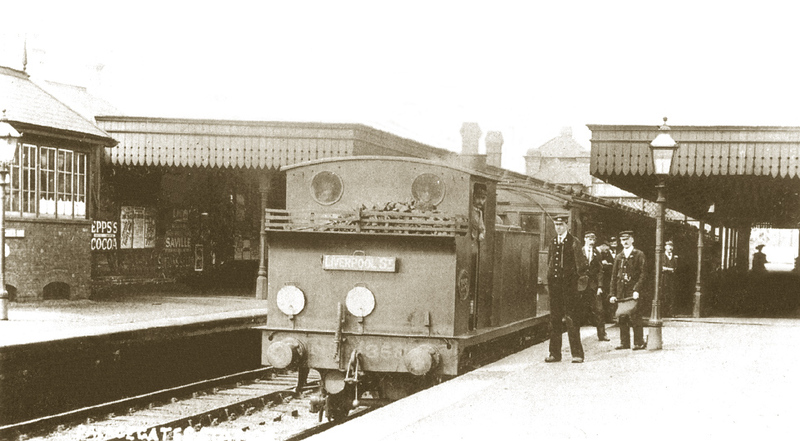 The photo is of a third class suburban close-coupled ‘Metropolitan’ carriage, no.903, designed by Howlden and built in 1900. 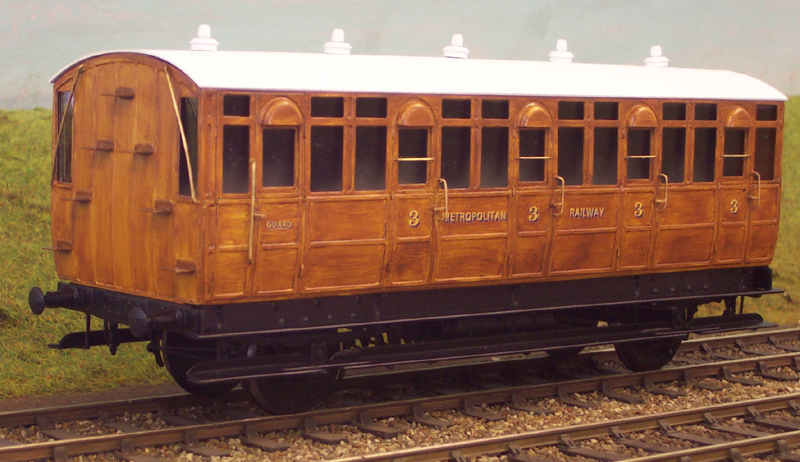 These ‘Metropolitan’ carriages were 9′ wide (to cram the hapless commuter in), with half-height compartments and 3″ recessed doors to maintain the lading gauge. Sister carriage no.902, as part of a Muswell Hill – Kings Cross train was involved in a collision at Finsbury Park in 1907. Of course it’s entirely possible the carriages listed in the 1898 accident are not of the Metropolitan type, and are therefore a red herring. Further updates on these will appear as and when more information comes to light. Metropolitan Jubilee 4-wheel coaching stock, part 2. Discussion between John and Ken de Groome resulted in the artwork being redrawn and added to by John, and once etched they were married to castings from Ken’s range so that now the full series of Metropolitan Jubilee carriages – a first, a second, a third, a brake second and a brake third carriage, along with alternative parts for those sold the the Mid Suffolk Light Railway in 1905 (seven were also sold the Weston Clevedon & Portishead in 1907), are now a part his range of Metropolitan Railway kits. Ken’s first test build, a brake third which he built and painted, is illustrated above. The first two of nine carriages (the brake second and a third on one fret, and two underframes on another, plus a bag of castings) arrived here yesterday, but will have to get packed away in one of the bulging stock cupboards for a couple of months while I catch up on commissions. And jolly nice they look too!